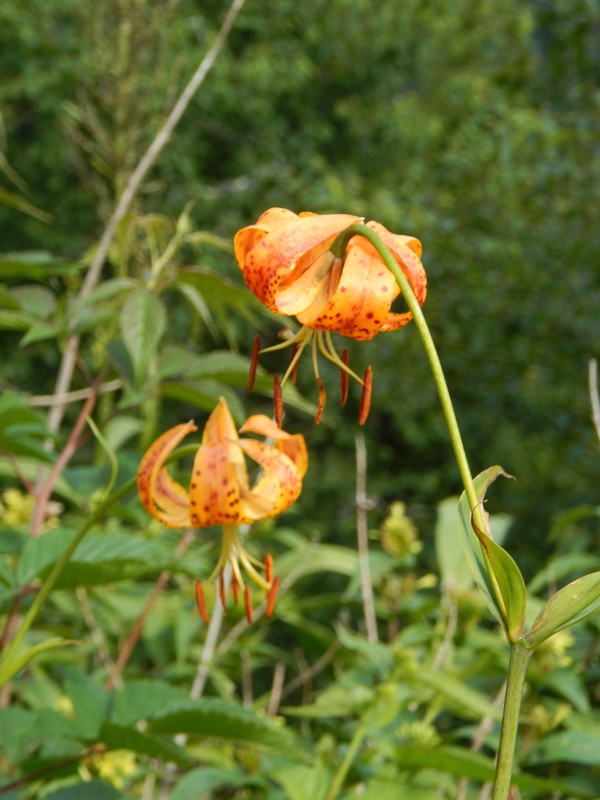 Hiking the Obed/Emory section of the Cumberland Trail. 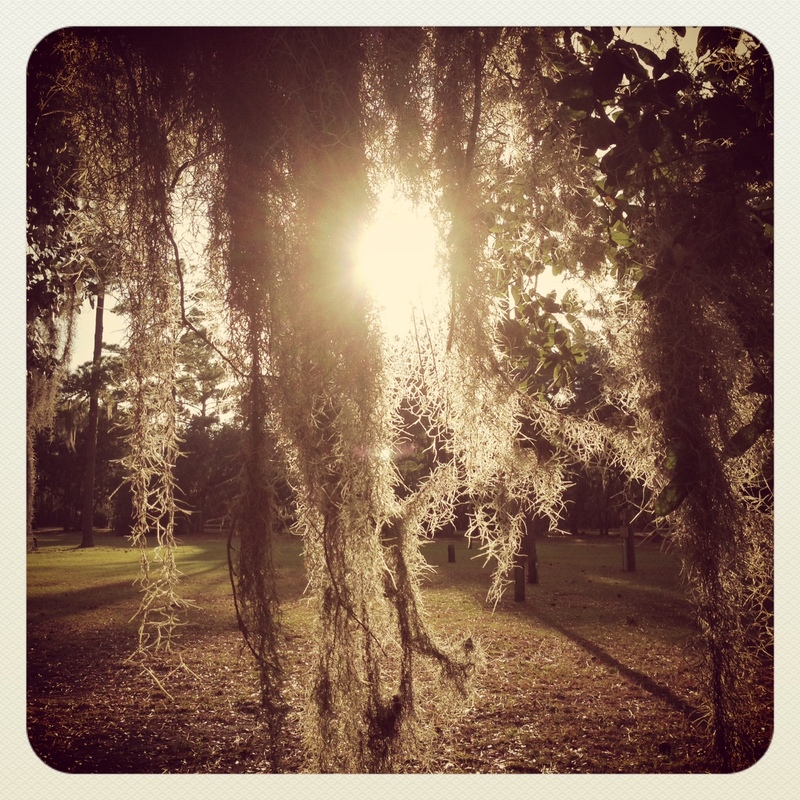 What was it Styx sang oh so long ago–Nothing ever goes as planned, it’s a hell of a notion. Even pharaohs turn to sand . . . The intention today was to hike three trails despite the fact that each of them was a generous distance apart, and despite the fact we were starting out the day already tired. We arrived at the first Cumberland Trail section ready to go, and immediately headed in the wrong direction. 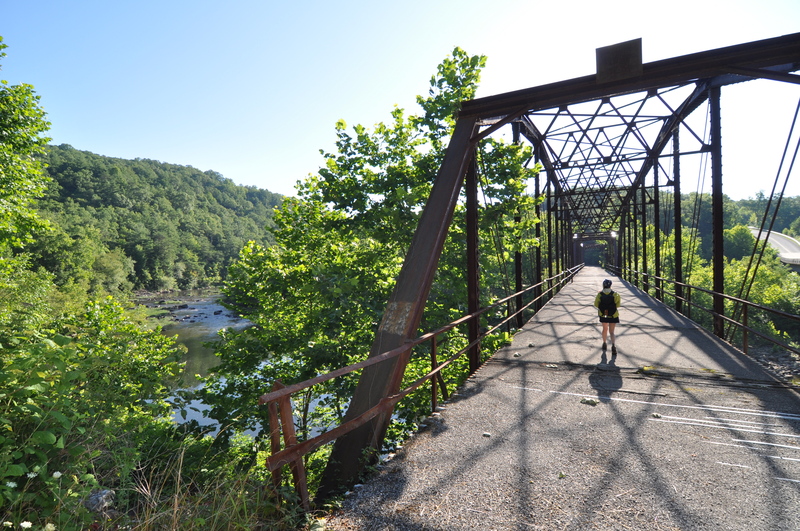 Fortunately, that was remedied pretty quickly and we were soon crossing an old bridge over the Obed River and on our way to a nice overlook above the confluence of the Emory and Obed Rivers. The overlook was created when the railroad blasted away part of the plateau to make room for train tracks, and we were actually fortunate enough to have a train race past just below us while on the overlook. One trail down, two to go. Another longish drive took us to the second section we intended to hike. 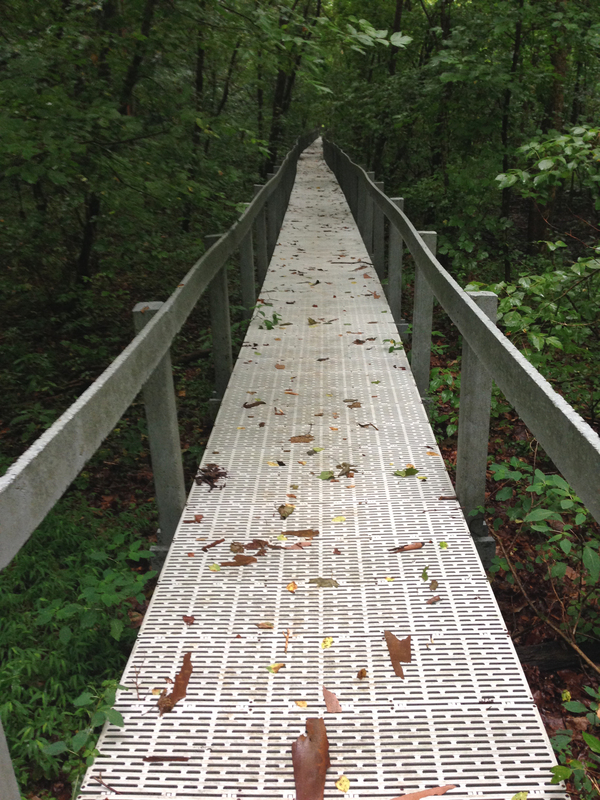 But, at the trailhead we discovered that not only was the 50-foot footbridge that would take us to our destination “out”. Not sure why but it was unavailable to be crossed. But also, our destination, a 150-foot bridge over the river, is now home to some aggressive hornets. 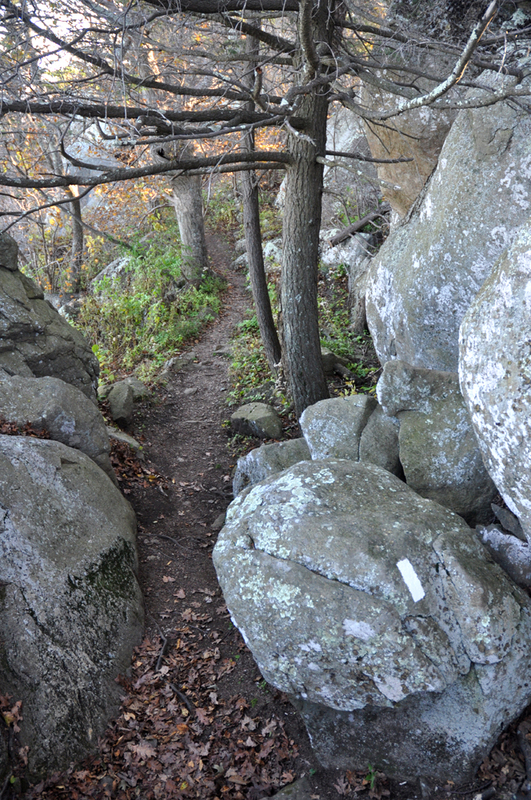 Neither could we hike the side trails to either of the falls as both were on the opposite side of the 50-foot bridge. Oh well. Strike that hike. 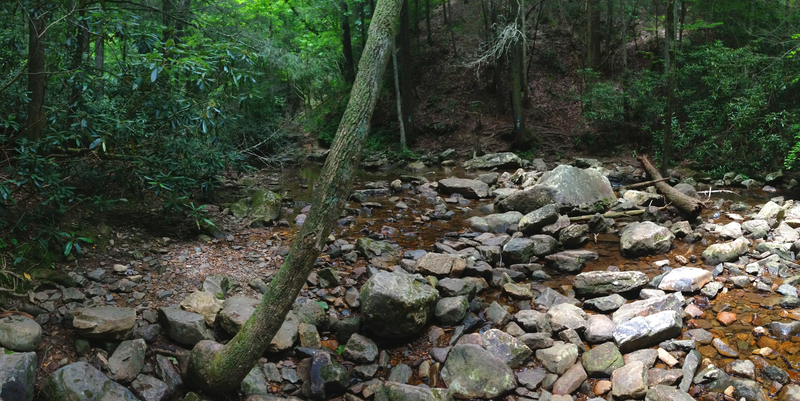 Yet another drive took us to Trail #3 in the Cherokee National Forest. That worked out just fine, thank goodness. 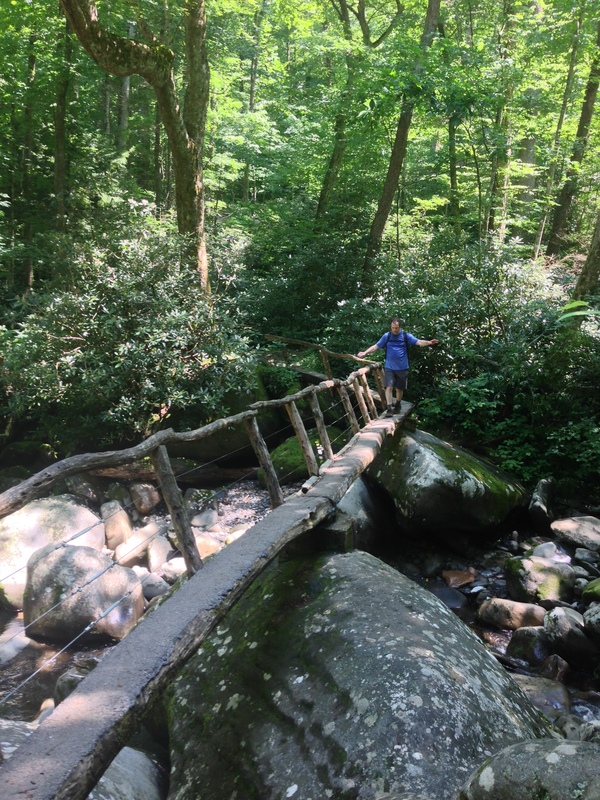 It was an easy hike along Rock Creek up to a falls and involved two stream crossings, but by the time we were back at the trailhead, it was much too late to attempt a third hike in the Cherokee National Forest. 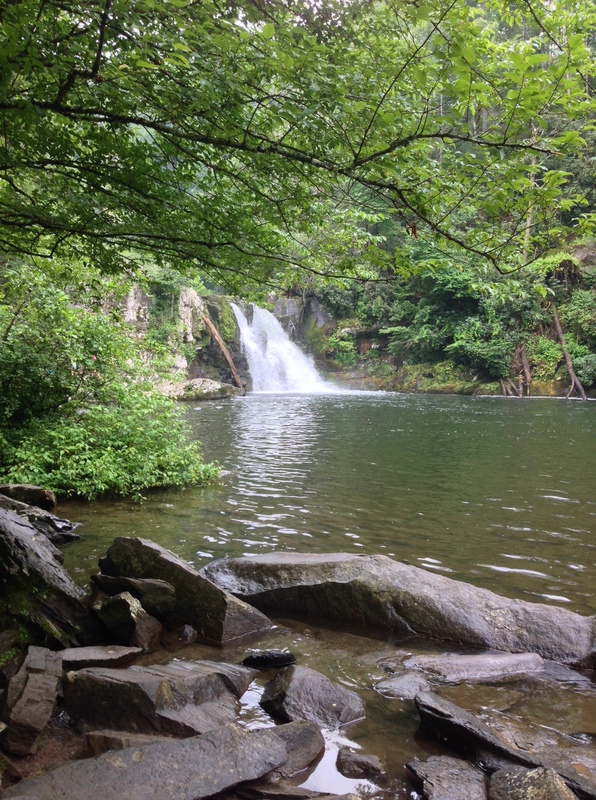 So, that hike, and a final hike in the Smokies, remain for tomorrow. And then I’ll be through hiking for awhile, as in finished. 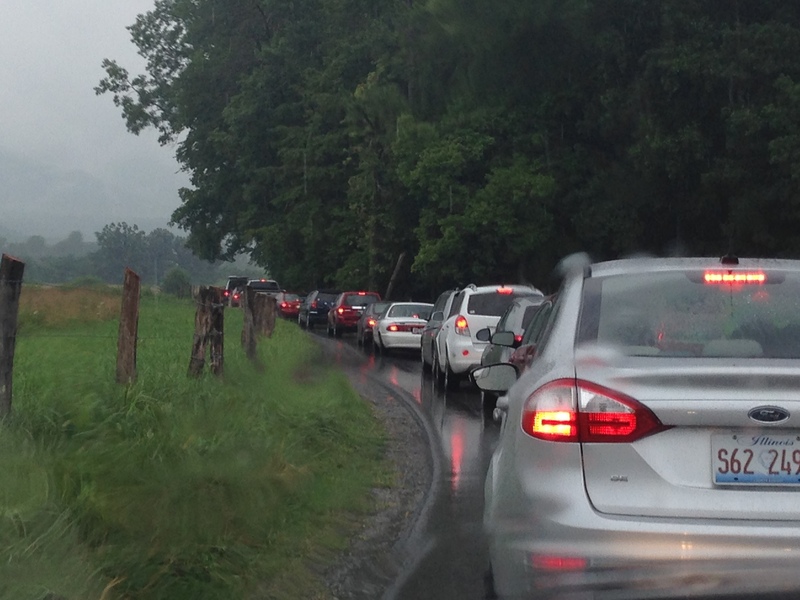 Rock Creek crossing. By Frank. It was tough to get a photo of the falls, which looked better in person. It was cold but beautiful atop Jane Bald. Looking back toward Roan Mountain. It has been both a magical and surreal as well as a long and exhausting day. I spent most of the day in my rain coat but not because it was raining. Rather, the temperatures dropped so much last night that the first half of the day was spent hiking in temperatures in the low 50s. In mid-July! Needless to say, my Raynaud’s Phenomenon wasn’t happy but I ignored it because the hikes on Roan Mountain and Round and Jane balds were so awesome that I just couldn’t be troubled. 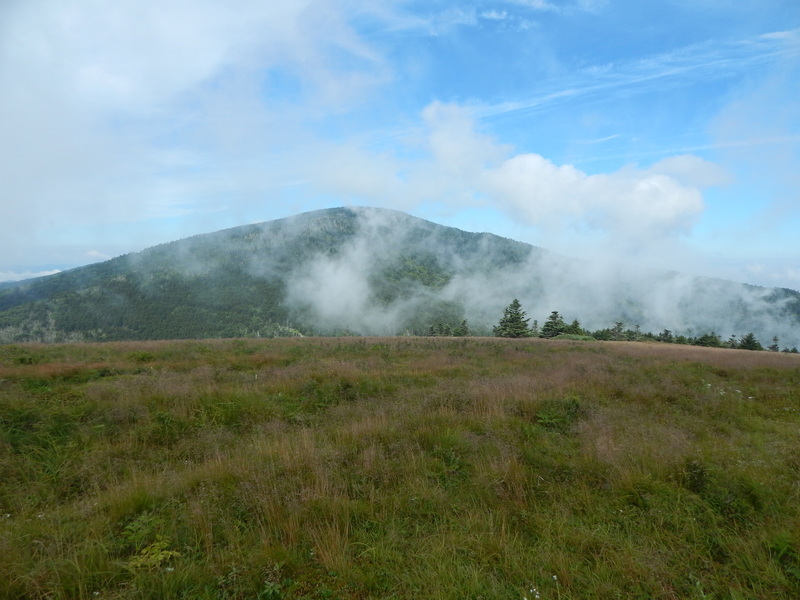 Roan Mountain as seen from Round Bald. 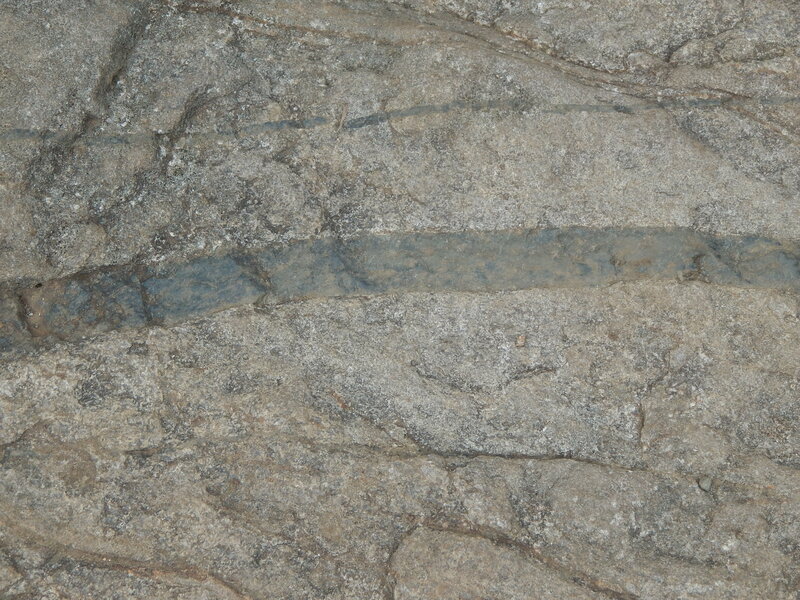 The oldest rock on the Appalachian Trail–1.1 Billion year old Gneiss with a black rock intrusion. 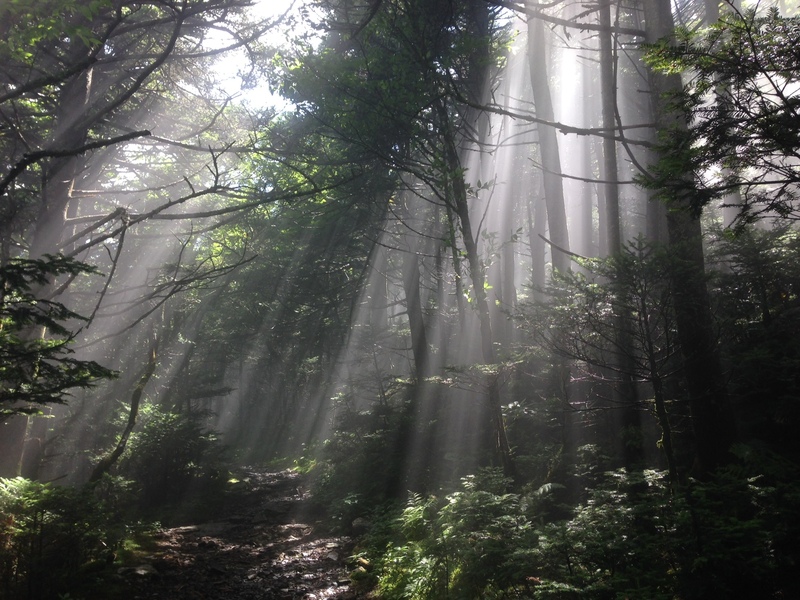 The fae Balsam Fir forest on Roan Mountain. More than a mile high, clouds skittering past us, magic and perfumed Balsam Fir forests and grassy balds lined with blueberries. 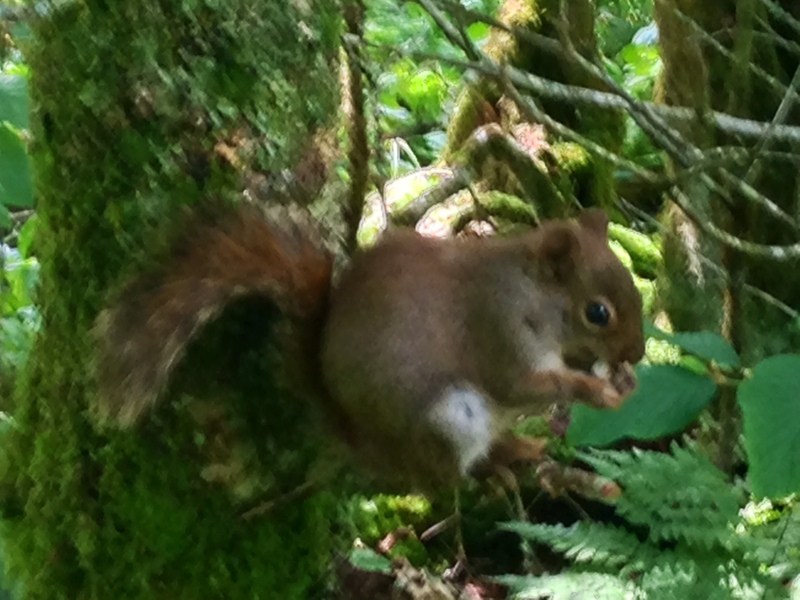 Wildlife from the small–chipmunks and bunnies–to the large–deer and black bear–only added to the pleasure. 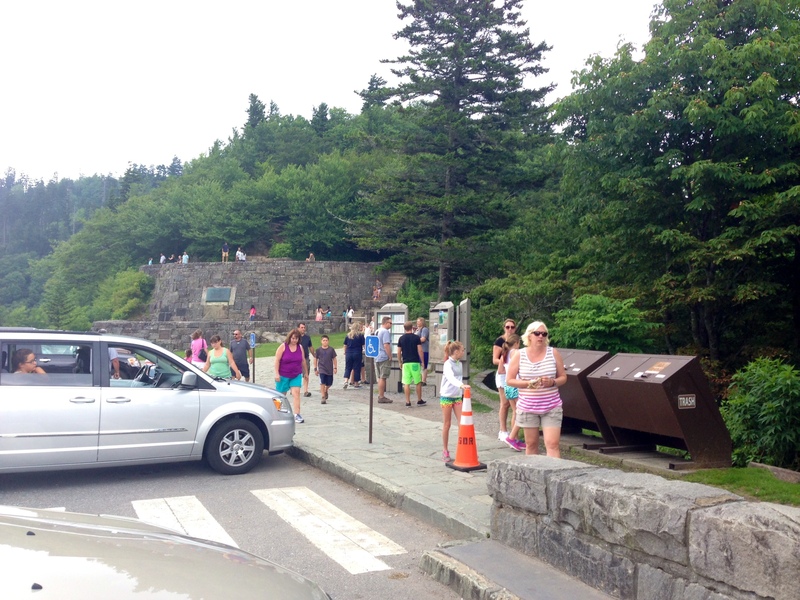 And, having just finished “The Shining” by Stephen King, it was fun to visit the site of the former Cloudland Hotel high atop Roan Mountain which straddled the Tennessee-North Carolina border from the late 1800s until 1914 when it was dismantled. A shorter history than King’s “The Overlook,” but I had to wonder why they closed it down. And a side note: the mountain is showing the effects of the reduction in acid rain. The old firs may be dying but the new ones are healthier and look much more ready to take over, as do the plants on the balds. See. We can change things for the better. 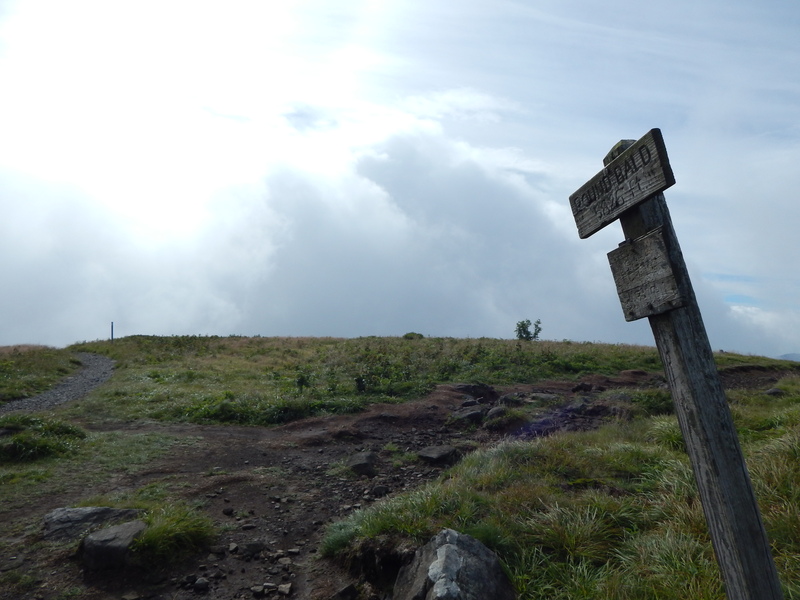 From high atop the mountain, in excess of 6,000 feet, we descended to Roan Mountain State Park. There we hiked a couple of trails, including the very strenuous Raven’s Rock Overlook, which led us more than 500 feet straight up a ridge for awesome views over the valley. A trail along the Doe River was hiked before we headed on to Davy Crockett Birthplace State Historic Area and hiked through its meadows and alongside Limestone Creek. And saw the cabin Crockett was born in, of course. And then we had spent more than 10 hours working/hiking and were ready for a rest. 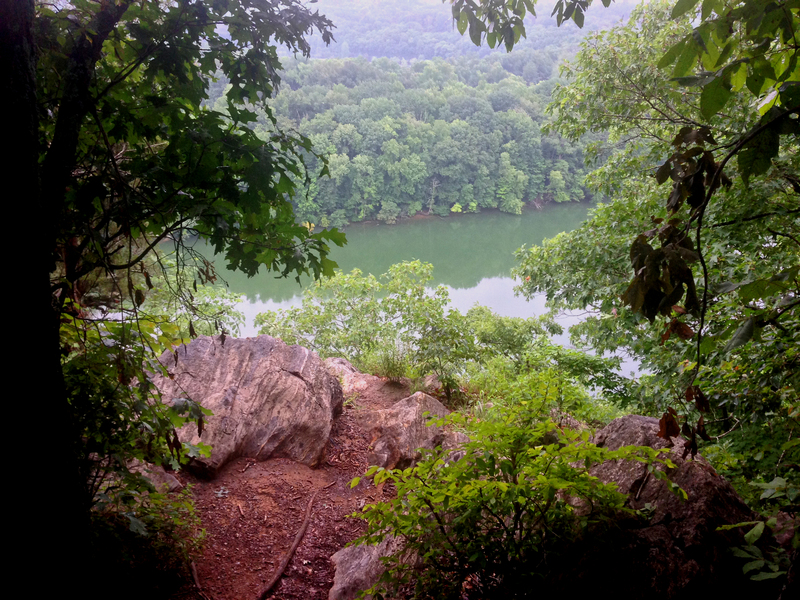 From the overlook at Raven’s Rock. By Frank. 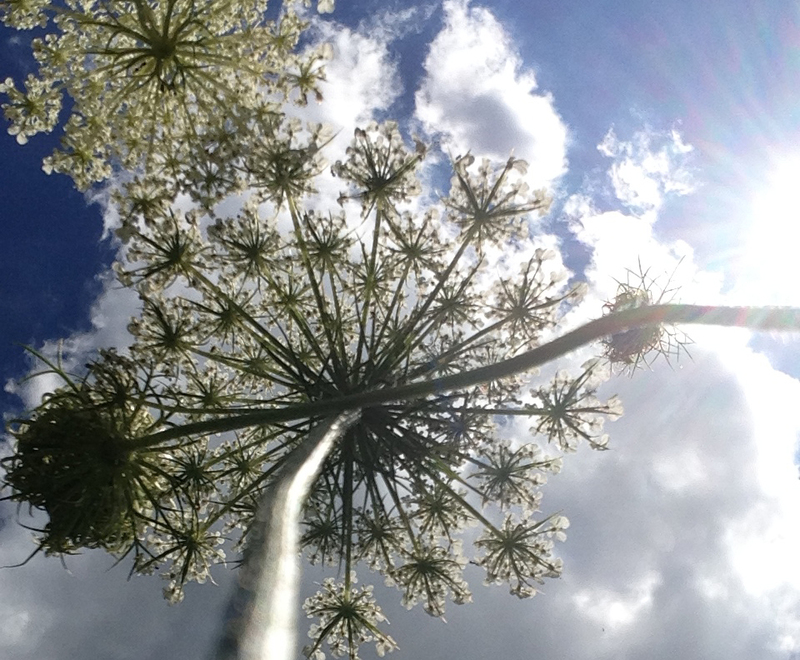 Ended the day in a fairy realm of Queen Anne’s Lace and lots of bunnies. By Frank. 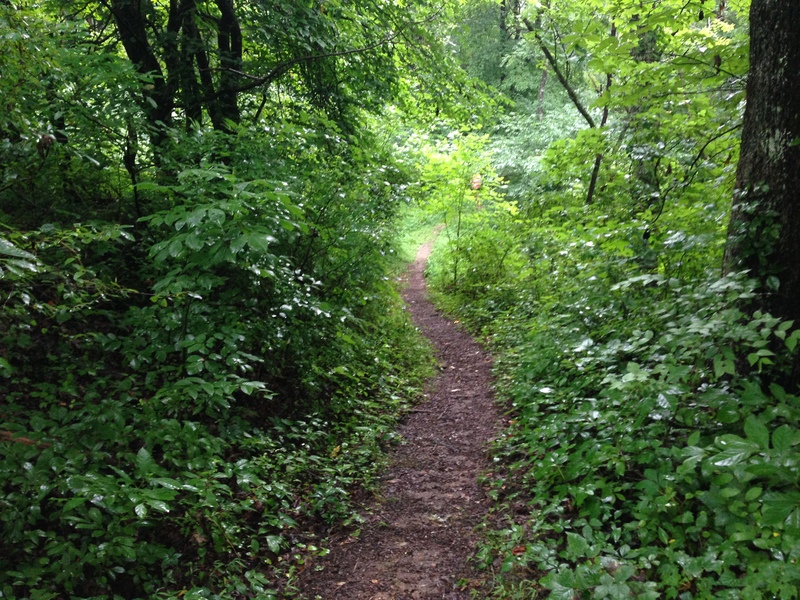 Tomorrow some sections of the Cumberland Trail. Rain with a hint of sunshine along the Sinking Waters Trail. The wetlands section of the Sinking Waters Trail (by Frank). Though the skies remained grey and leaden the entire day, we were fortunate enough to only have to hike in the rain early this morning. 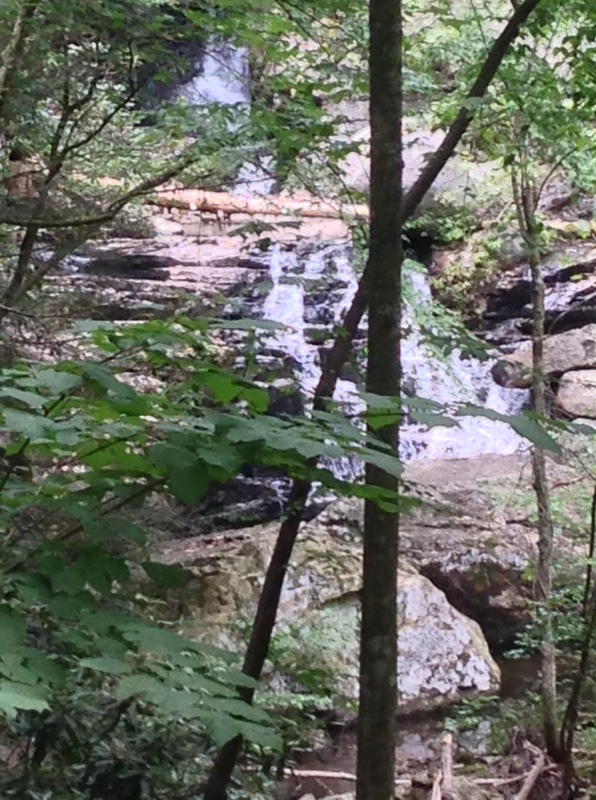 From Warrior’s Path State Park and its strenuous Sinking Waters and Devil’s Backbone trails to Sycamore Shoals and its easy riverside walk to a final strenuous hike along the Appalachian Trail to Laurel Fork Falls, we managed to stay mostly dry. As a matter of fact, the actual downpour didn’t occur until we were ensconced in a booth finally eating our first real meal of the day late in the afternoon in Elizabethton. Maybe the two pennies I found while hiking really were lucky! 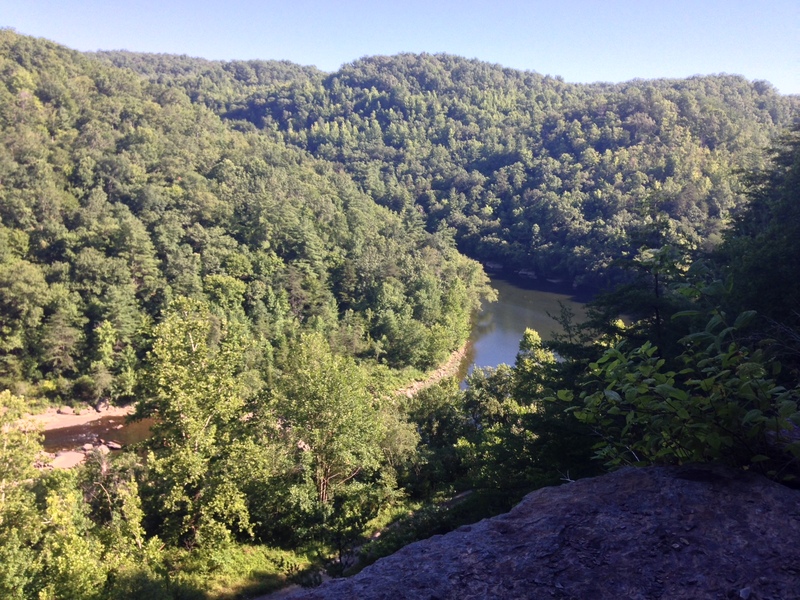 We both looked down on and walked alongside the Holston River on the Devil’s Backbone Trail. (By Frank). The most bizarre part of the day is when we emerged from the woods of the Devil’s Backbone Trail to discover that though it was raining in the woods, it was no longer raining in the open. I guess it just takes a while for the rain to filter through the trees. 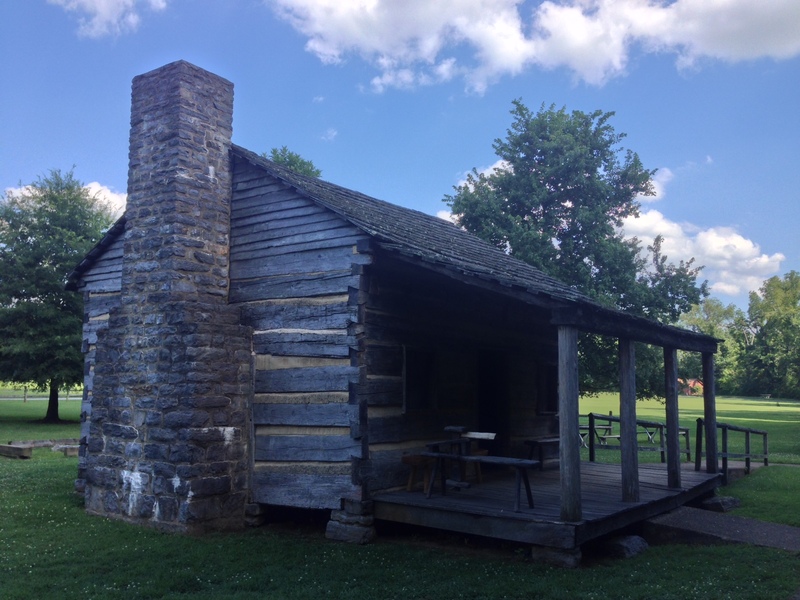 THE Sycamore Shoals on the Watauga River (by Frank). We ended our 10-plus mile day having hiked in three different locales and once again tired. Hiking and driving really takes its toll, but the fact I am working on a book that takes in the Appalachian Trail earned us a good rate (and reviving hot shower) at a local inn. 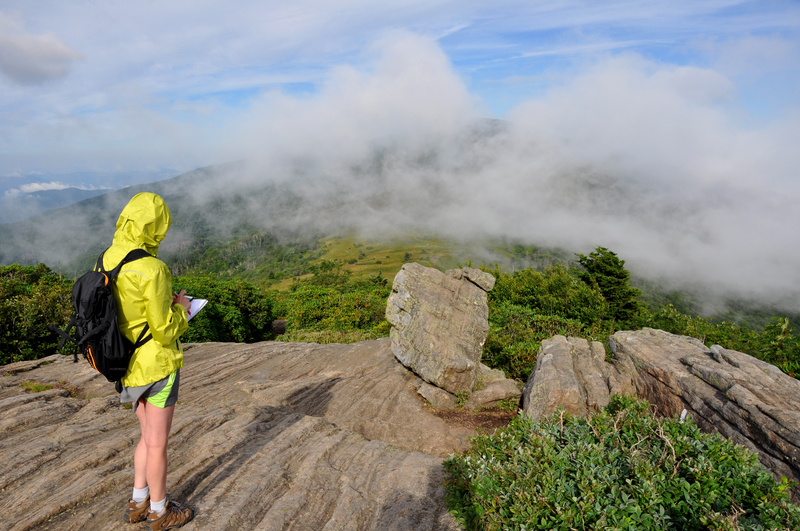 Tomorrow, we take on Roan Mountain State Park and the Appalachian Trail at Roan Mountain (one of the most beautiful spots in Tennessee in my humble opinion). Although to give them some credit, it’s right on the Tennessee/North Carolina border. It was also in that vicinity, that we spent several days in a barn with a troop of Boy Scouts following a snowstorm that dropped more than a foot of snow on the mountains in April (while we were hiking the Appalachian Trail). But, that’s another story. 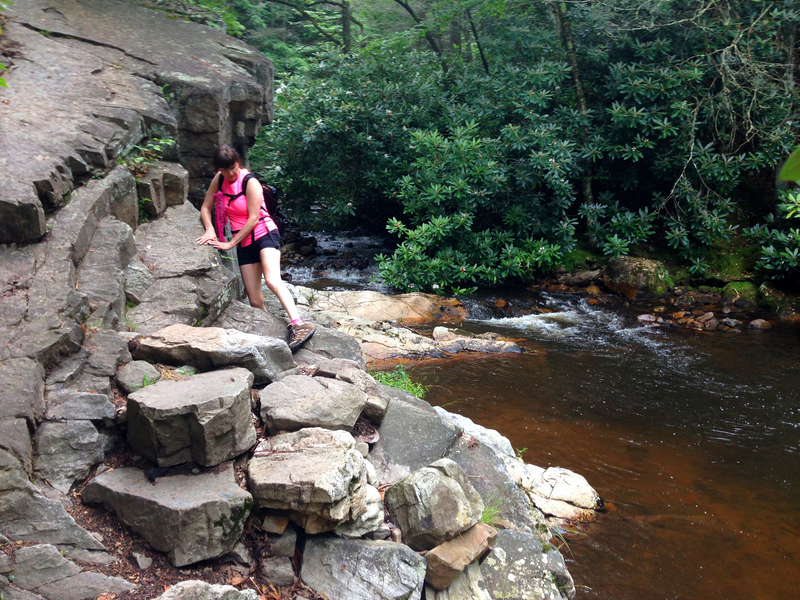 Rock scramble at Laurel Fork. 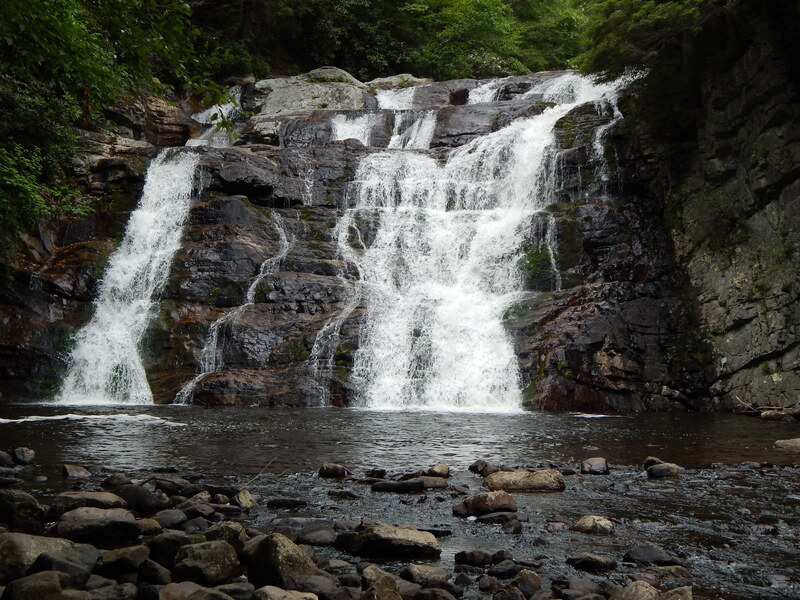 Laurel Fork Falls on the Appalachian Trail. Yes, hiking the first trail this morning was a definite high in more ways than one. Not only were we more than a mile high, but hiking through the balsam fir forest first thing in the morning before the heat of the day descended was breathtaking in itself. There were four other people hiking right behind us, but we managed to get there and have about five minutes to ourselves before the others arrived. 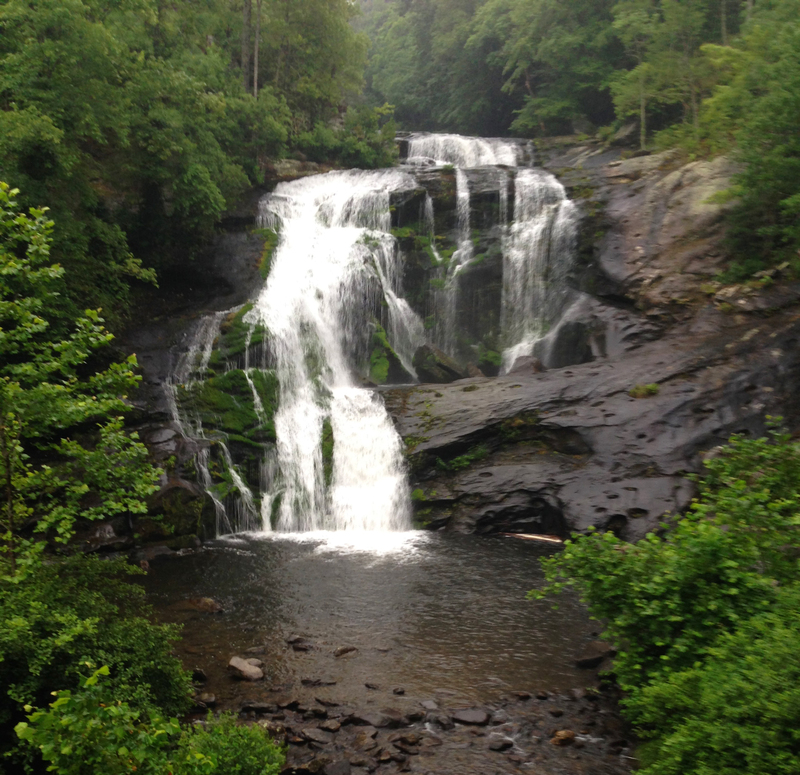 But, when we got back to Newfound Gap, eight miles later (the rest area with tremendous views between Gatlinburg, Tennessee, and Cherokee, North Carolina), it was like walking into an amusement park. Culture shock, really. We did pass a number of hikers heading toward the Bunion on the way back down, but the crowds in the parking lot were mind numbing. This is just a sample. 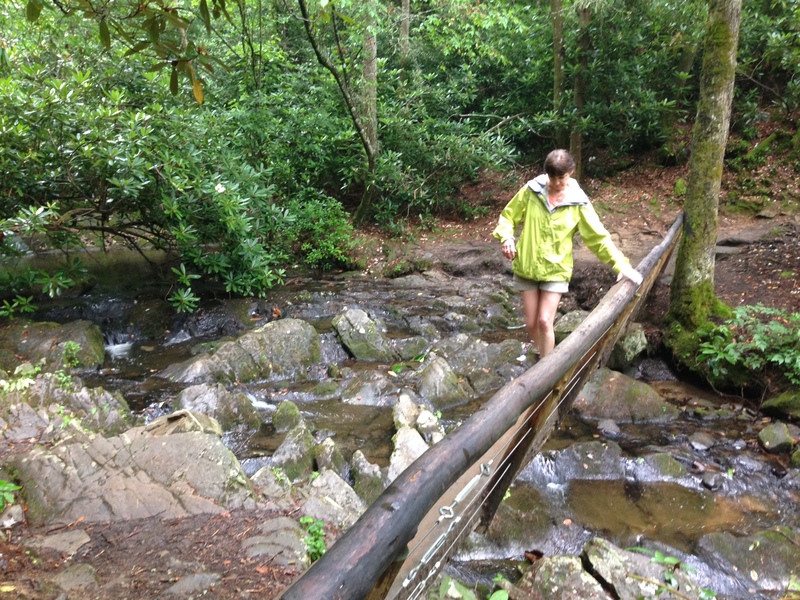 From Newfound Gap, we descended to Gatlinburg and headed to the Porter’s Creek Trail access. Seemingly in the middle of nowhere (down a long bumpy gravel road), there were still plenty of people there when we arrived. The trail was fine but the hike a little disappointing. There was one precarious trail crossing across the eponymous creek that messed with my equilibrium. It had a weird angled handhold that threw me off, but Frank managed it by not holding on. I, unfortunately, have a fear of heights that usually translates to spaghetti legs. I wasn’t aware of this fear until I had to descend Diamond Head on Oahu as a teen. Still haven’t conquered it, but I just power through it. Feets don’t fail me now and all that. Frank easily taking the bridge. 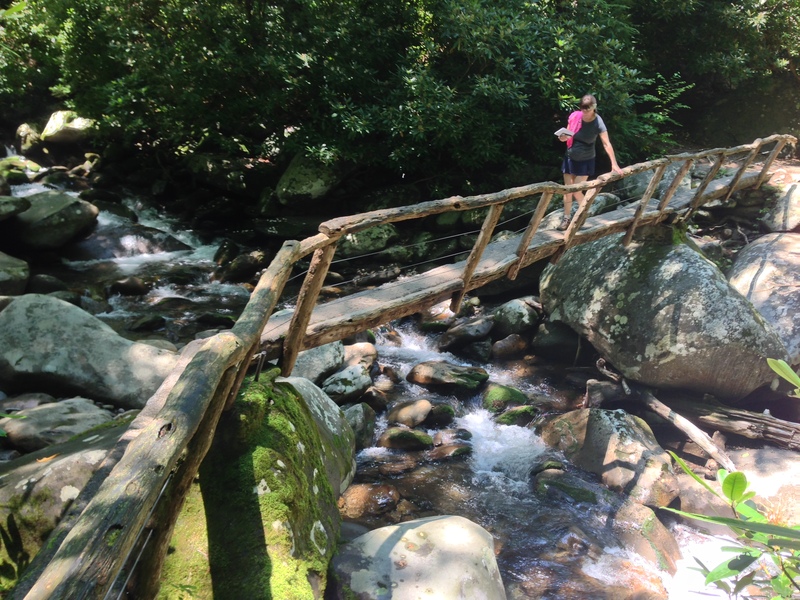 Only eight more parks to go, including the Great Smoky Mountains and the Appalachian Trail. Today, we are leaving the moss-draped and iron flat coastal plain for the high elevations and balsam fir forests of the Appalachian Mountains. I won’t be leaving the heat behind, though. From what I can tell, Tennessee is neither significantly cooler nor dryer than it is here in Savannah at this time of year. Although, I imagine, it will be a little less humid.